Like the other cities in Rajasthan, Jodhpur has many talented and skilled craftsmen, including textile dyers, metal engravers and die-makers. The popular items of Jodhpur are antiques, bandhini and footwear. 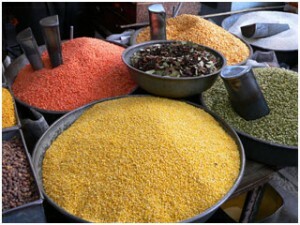 In the sprawling market you’ll find an good assortment of the remarkable goods available in Jodhpur. At Sojati Gate you can find some amazing tie-dye Saris. Station Road is known for its leather, embroidery, and utensils. Then take a stroll in Tripolia Bazaar where you can shop for local handicrafts and textiles. At Mochi Bazaar you’ll be able to browse the famous Lac works such as bangles and other pieces of jewelry. In Nai Sarak buy tie-dye dresses, leather goods, and handlooms. Finally, check out Clock Tower where you’ll find more textiles and handicrafts, but see the magical colors or spices. Choose some to take back home for your next exotic dinner party. Near Jodhpur in the arid countryside are the Bishoni villages, which are communities of potters and weavers living in traditional mud houses. The Bishonis are passionate environmentalists, where their faith bids them to protect every living being, if necessary with their own lives.